I think that this gadget is the best netbook for educators 2.0 like you and me, folk. The best choice if you don't have more money than 500 euros more or less. 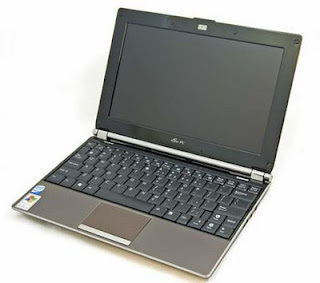 Asus eeePC is Easy to Learn, Work and Play. 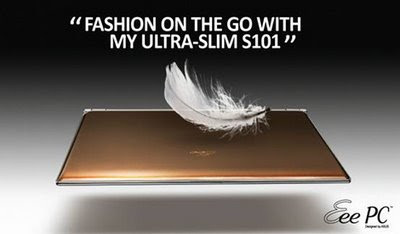 Go through these links and you'll think about buying the new Asus s101 notebook, a webcam netbook with rapid WiFi n connectivity. A must-have for eduvloggers. Sure. Awesome laptop. Sorry, not laptop, but netbook. It is clear the reason of that. Slim and 1 kg netbook with a 10.2 inch screen. Techcast video Review of the Asus s101. CNET review of the s101. Wikio review, prices, photos and accesories. This is the new BIOS for the S101. Running GNU/Linux with the Asus s101 netbook. A good choice in GNU/Linux is Easy Peasy Linux. As you have seen, just fashion on the go for educators like you and me.. for educators who produce video clips on the go publishing them on the Internet in vlogs like Eduvlog.